A Japanese sushi boss has paid a record USD 3.1million for a giant tuna at the first new year’s auction in Tokyo’s new fish market. 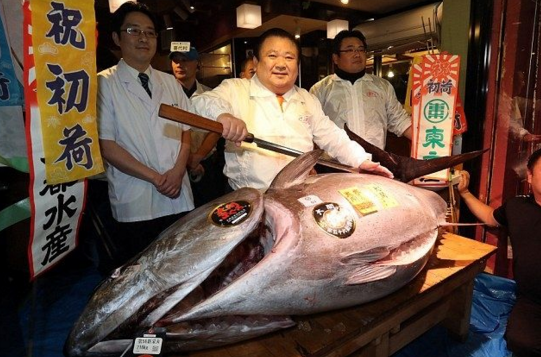 Self-styled "Tuna King" Kimura bought the 278kg (612lbs) blue fin tuna, which is an endangered species. He spent more than twice the previous record of $1.4million, which he paid in 2013. Wholesalers and sushi company owners often pay high prices for the best fish at the first auction of the new year. "I bought a good tuna," Mr. Kimura said after the auction. "The price was higher than originally thought, but I hope that our customers will eat this excellent tuna." Mr. Kimura has been the highest bidder at the new year auction for seven of the past eight years. The 2019 auction is the first new year sale to take place at the new fish market, which opened in October. The market attracts many people to buy products. 1. What does the underlined word“giant” mean in Chinese? 2. Which is TRUE about the blue fin tuna? C It can be seen everywhere. D It can’t be eaten. A The new fish market opened in May. B Mr. Kimura bought the 278kg blue fin tuna. C The price of this blue fin tuna was higher than originally thought. D Wholesalers and sushi company owners often pay high prices for the best fish. 4. What is the best title for the passage? A A Japanese Sushi Boss. C A New Fish Market.